An error occurred due to material law integration problem. Please check your material parameter units or try to use automatic timestepping scheme rather than manual with smaller initial timesteps under Simulation Control. The solution diverged due to non-resolution of nonlinear material behavior e.g. plastic material following either the use of non consistent units or larger time step. This error may occur when either the units of material are not consistent with the geometry (which may lead to high material or geometric nonlinearity) or the time step for solving the nonlinear material behavior is too large. 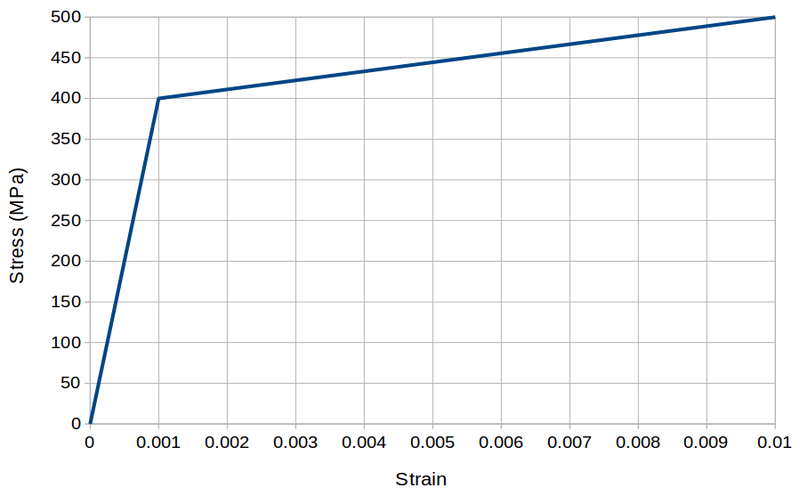 Let’s consider a case where material is considered nearly perfectly plastic after the strain value of 0.001 as shown in the stress-strain graph below. Now if the simulation is performed such that the initial deformation of the geometry gives the strain larger than the strain where yielding starts (0.001 in this case) using manual timestepping scheme, than the solution will diverge giving this error since it can’t be able to capture the material behavior with in the given time step. To avoid this error, we can use automatic timestepping scheme with fairly small initial time step value such that this nonlinear behavior can be captured easily with in the initial time step(s).